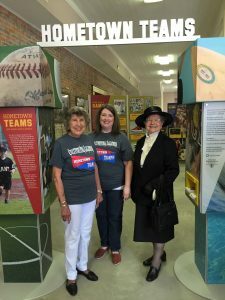 On Friday, April 21, 2017, the Dallas County Sports Museum at 200 N. Main Street opened its doors to the public for its newest exhibit, Hometown Teams: How Sports Shape America, with a ribbon-cutting ceremony performed by Carol Harsh, Director of the Smithsonian Institution Traveling Exhibition Service, Jama Best, Senior Program Officer of the Arkansas Humanities Council, and museum directors Agnes Phillips and Melrose Bagwell. The Dallas County Museum is the first museum in Arkansas ever to host a Smithsonian exhibit, and the crowds who attended over the Fordyce on the Cotton Belt Festival weekend were enthusiastic. 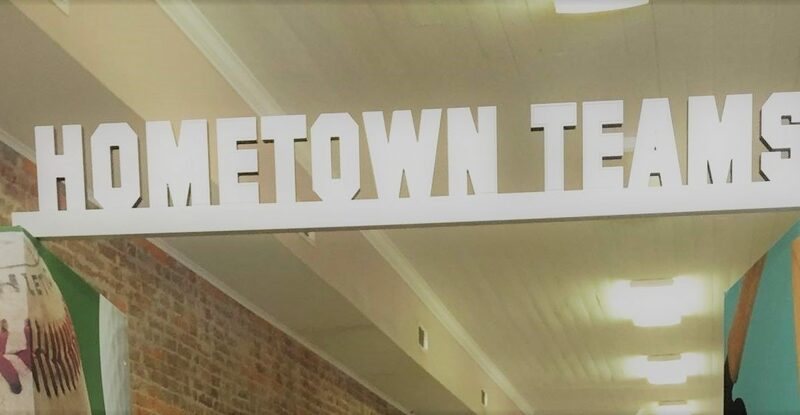 With the exhibition, which winds through the old People’s Store adjacent to the sports museum, is an impressive display of projects by students of their Hometown Hero. In our sports museum are new exhibits, including the basketball uniform worn by Fay Nutt in the Deaf Olympics in Milan, Italy, loaned to us by his widow, Doris Nutt, who also donated photos of herself and the Carthage Blue Devils girls basketball team, which now hang on the walls in the Nutt exhibit. We invite everyone to visit while the Smithsonian is still in town; Hometown Teams will be here until Saturday, June 3.